Carrying a balance on your credit card can burn a hole in your wallet if you’re paying interest on what you owe. Transferring the balance to a card with a 0% introductory Annual Percentage Rate (APR) offer, is one way to reduce the cost of finance charges. If you’re ready to save money on an existing eligible balance, with responsible use by you, a card with a 0% introductory APR on balance transfers can be a tool to help you achieve that goal. The Chase Slate® credit card offers a 0% introductory Annual Percentage Rate (APR) for 15 months on purchases and balance transfers from account opening. After that there is a 17.24% – 25.99% Variable APR on purchases and balance transfers. There is a $0 introductory balance transfer fee for transfers made during the first 60 days your account is open. After that, the fee for future balance transfer transactions is 5% of the amount transferred, with a minimum of $5. Balance transfers with a $0 introductory balance transfer fee are almost unheard of. Annual Percentage Rate (APR) on Purchases: 0% Introductory APR for 15 months on purchases from account opening. After that, 17.24% - 25.99% Variable APR. Annual Percentage Rate (APR) on Balance Transfers: 0% Introductory APR for 15 months on balance transfers from account opening. After that, 17.24% - 25.99% Variable APR. Balance Transfer Fee: $0 Introductory balance transfer fee during the first 60 days your account is open. After that, the fee for future balance transfer transactions is 5% of the amount transferred with a minimum of $5. 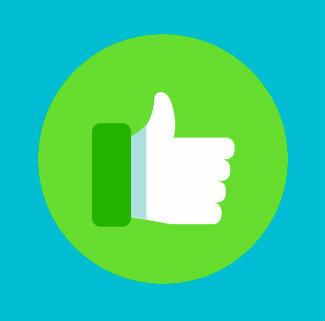 Our Verdict: Best for credit users who want to take advantage of a $0 introductory balance transfer fee for 60 days, get 0% intro APR for 15 months on purchases and balance transfers, and $0 annual fee. People who travel outside the U.S.
We think the Chase Slate® credit card may interest credit card applicants who hope to snag a 0% introductory APR offer on purchases and balance transfers. In addition to the introductory APR promotion, this card comes with a few other extras. Credit Journey℠ gives you unlimited access to your credit score and more. It’s free, even if you’re not a customer of Chase. 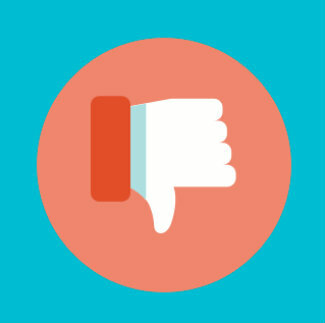 Checking your score does not affect your credit. The Chase Slate® credit card has no annual fee. This card won’t impose a penalty APR for late payments. All other account pricing and terms apply. The Chase Slate® credit card isn’t the only balance transfer card in the game. Here are the profiles of a few other balance transfer credit card options, so you can see what the competition has to offer. The Chase Slate® credit card and the Chase Freedom® card are on even footing with having no annual fee and the introductory APR duration. Chase Freedom® offers new cardmembers a 0% Introductory APR for 15 months from account opening on purchases and balance transfers, then a variable APR of 17.24-25.99%. Balance transfer fee is 3% of the amount transferred, $5 minimum. When compared to the Chase Slate® credit card, in our opinion, Chase Freedom® gives you a bigger bang for your buck, for one reason, by offering a cash back rewards program. With Chase Freedom® you earn 5% cash back on up to $1,500 spent in combined purchases in the bonus categories each quarter that you activate. Purchases above the $1,500 limit or outside the activated bonus categories earn unlimited 1% cash back. Secondly, new eligible cardmembers earn a $150 bonus after spending $500 on purchases in the first three months from account opening. If you want the double benefits of a 0% introductory APR on purchases and balance transfers as well as a card with a cash rewards program, we think this card is worth a second look. 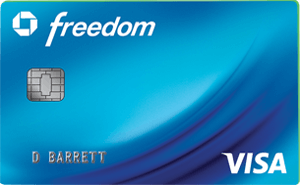 If you want to learn more click on the link below which will take you to a Chase Freedom® card details page. Learn more about Chase Freedom®. Cash back rewards program – earn 5% cash back at different places each quarter like gas stations, grocery stores, restaurants, Amazon.com and more up to the quarterly maximum, each time you activate. 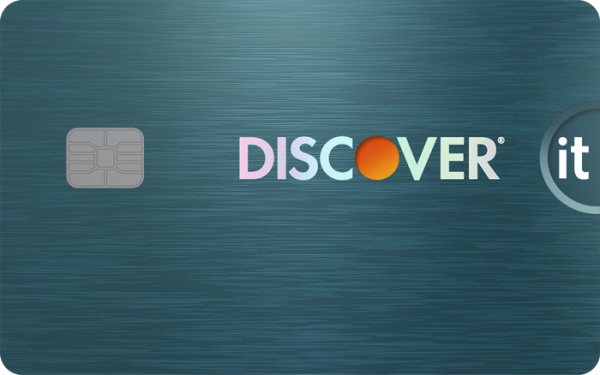 There is an introductory offer: Discover will match all the cash back you’ve earned at the end of your first year, automatically, for new cardmembers only. Another plus, there’s no signing up and no limit to how much is matched. There is no annual fee and there are no foreign transaction fees. There’s a lot to mention about the Discover it® Balance Transfer card starting with the 18 month, 0% introductory APR period on balance transfers. After the introductory APR period for balance transfers ends then a Standard Variable Purchase APR of 14.24% – 25.24% applies, based on your creditworthiness. There is a balance transfer fee of 3% of the amount of each transfer. This card also offers a 6 month, 0% introductory APR on purchases. After the introductory APR period for purchases ends then a Standard Variable Purchase APR of 14.24% – 25.24% applies, based on your creditworthiness. This card has no annual fee and no foreign transaction fees. A cash back rewards program adds to the Discover it® Balance Transfer appeal. With this card earn 5% cash back at different places each quarter like gas stations, grocery stores, restaurants, Amazon.com and more up to the quarterly maximum, each time you activate. Plus, you earn unlimited 1% cash back on all other purchases – automatically. There is an introductory offer: Discover will match all the cash back you’ve earned at the end of your first year, automatically, for new cardmembers only. This introductory offer does not require signing-up and there’s no limit to how much is matched. If you want to learn more, click on the link below which will take you to a Discover it® Balance Transfer details page. Learn more about Discover it® Balance Transfer. The fee for balance transfers is $0 introductory balance transfer fee for the first 60 days your account is open. After that, the fee for future balance transfers is 3% of each transaction (minimum $10). With the BankAmericard® credit card you can access your FICO® Score updated monthly for free within Online Banking or your Mobile Banking app. As mentioned earlier, the Chase Slate® credit card doesn’t come with a rewards program. You won’t be able to earn any points, miles or cash back for purchases made with your card and there’s no bonus for eligible new Cardmembers. For those choices, you can look at one of the other cards listed above. The feature we like best about the Chase Slate® credit card is the 15 months you get to pay off eligible purchases and balance transfers with 0% introductory APR (after that, a variable APR of 17.24% – 25.99% will apply.) The opportunity to have a $0 introductory balance transfer fee for transfers made during the first 60 days of account opening could be an incentive to choose this card over other cards that charge balance transfer fees. On the flip side, transfers executed after the first 60 days face a balance transfer fee of 5% of the amount transferred with a minimum of $5. That’s higher than the 3% most cards typically charge. On a $5,000 transfer, the 5% balance transfer fee amounts to $250 verses a balance transfer fee of 3% which amounts to $150, which makes this card slightly more expensive if you decide to transfer a balance after the $0 introductory balance transfer fee period ends. The lack of a rewards program is also something that some credit card holders may find unappealing. If earning rewards is important to you, you may need to consider supplementing the Chase Slate® credit card with another card that offers the cash back, points or miles you’re seeking. If you want a no-frills, no-fuss way to transfer balances, the Chase Slate® credit card is one you may want to consider. As long as you complete transfers promptly after opening your account, during the first 60 days of account opening, you won’t pay a balance transfer fee, and there’s no pricey annual fee to worry about either. 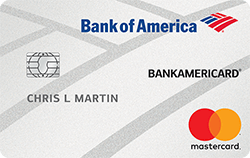 However the BankAmericard® credit card is another no-frills type of card and may also be worth a closer look too. Although Chase doesn’t disclose on its website the minimum credit score you’ll need to qualify for this card, as a general rule, the higher your score, the easier it may be to get approved. Keep in mind, credit scores are just one criteria that credit card issuers use to determine if you are eligible for one of their credit cards, credit card issuers use a variety of different types of credit score models and other criteria to make credit decisions. Take a look at your free credit report card from Credit Sesame to get an idea on where you stand. Independent Review Disclosure: All the information about the BankAmericard® credit card and the Chase Slate® credit card has been collected independently by CreditSesame.com and has not been reviewed or provided by the issuers of these cards. The BankAmericard® credit card and the Chase Slate® credit card are not available through CreditSesame.com.